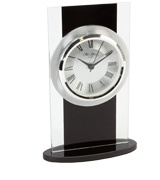 Rhythm Clock 4SG768WR19 Mantel clock from the Contemporary Mantel Clocks range. The increased size of the clock dial, in combination with a stark contrast of colours, make it easier to read the clock face regardless of time of day. The current time can be seen even from across the room. The sticker on the front glass panel is rather hard to remove. 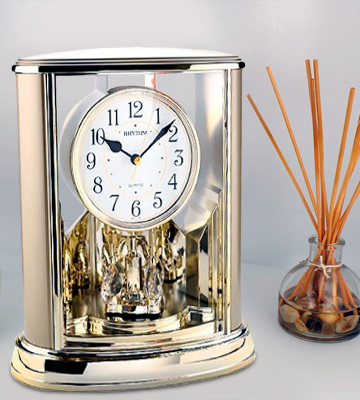 This model is one of the most interesting ones among modern mantel clocks thanks to its premium quality of build and a number of decorative elements on the housing. On top of that, the spiral rotating pendulum is just nice to look at. 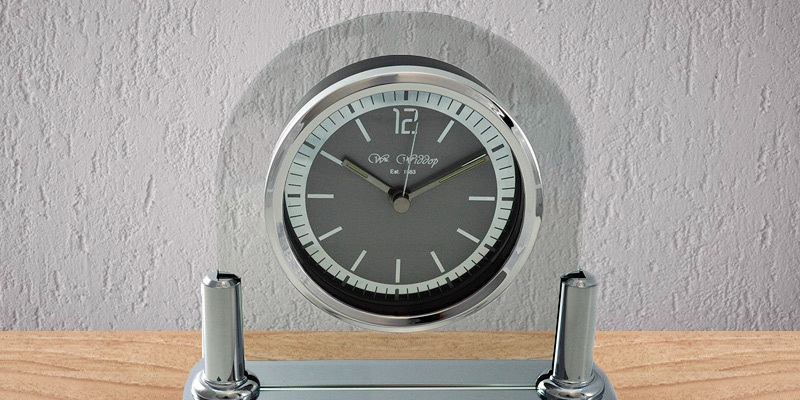 The design of this model features two hanging holes on the back of the housing so you can mount the clock not only on the mantlepiece but on the walls as well. It is difficult to read the clock face from a distance. The clock from Hometime is precise. The housing is absolutely gorgeous. 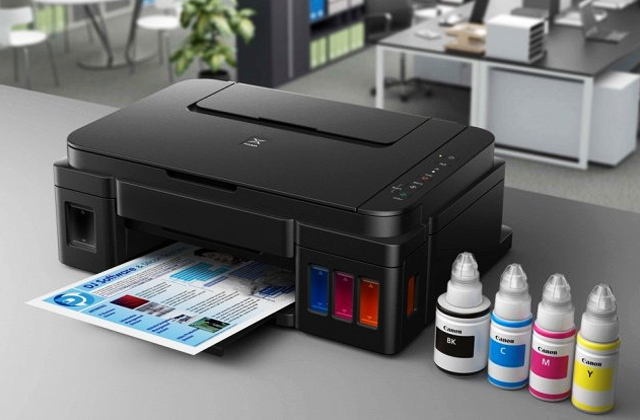 An ideal model for virtually any room in your house or flat. 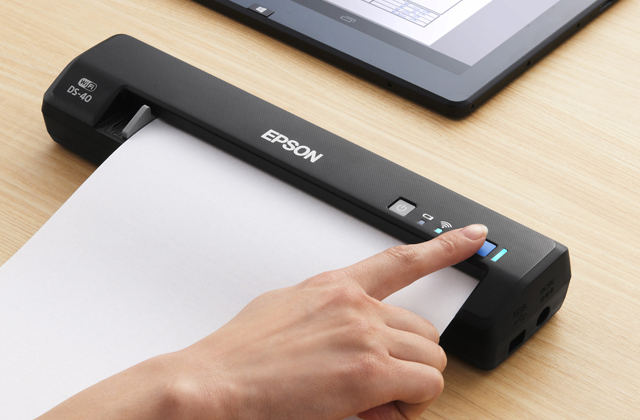 It won't require winding up even after months of use. 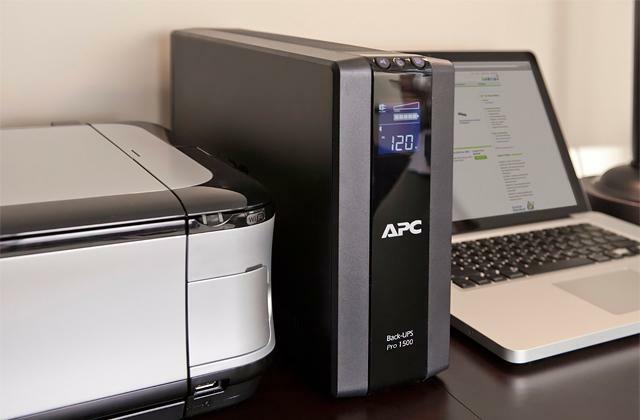 The power-saving digital mechanism of the clock makes 2 regular AA batteries last for 1-2 years before you'll have to replace them. The golden paint tends to peel off over time if not washed properly. 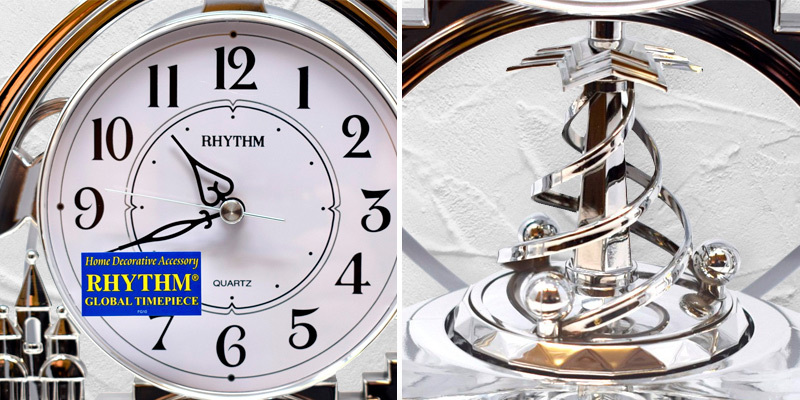 Yet another stylish and elegant model from a Japanese manufacturer, Rhythm, features a unique rotating teardrop pendulum and a large-scale clock dial that can be read easily. This model features arms and a clock dial with fluorescent elements that can be seen even in a pitch-black environment. Just put the clock in a bright room during the day and the elements will recharge themselves. Some may find the ticking sound a little too loud. 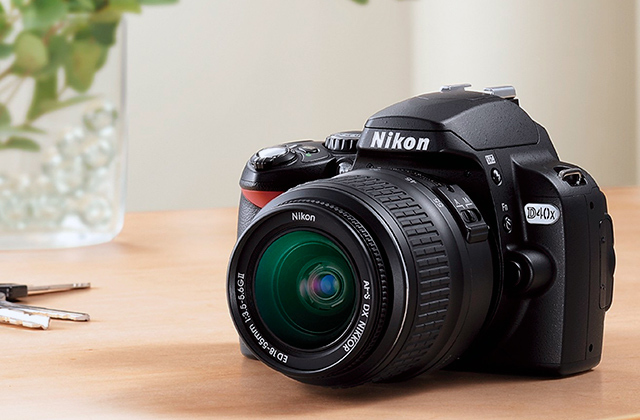 If you are looking for a great gift for a close family member, then this model will be one of the top contenders for this role. 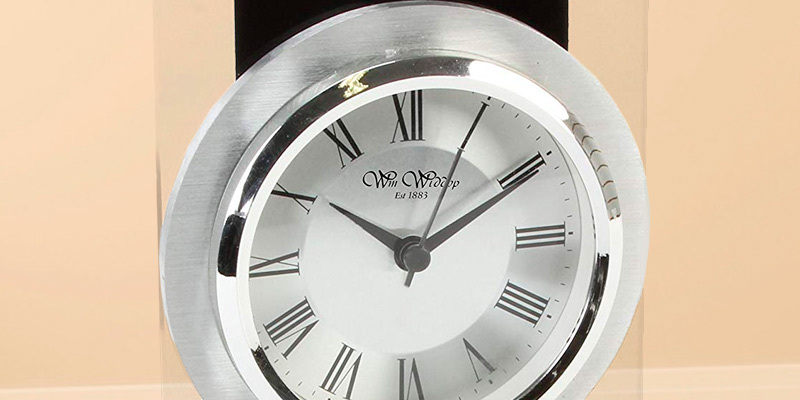 The manufacturer provides an option to engrave the silver-coloured plate with up to 20 symbols, so you'll be able to make this clock a memorable present. 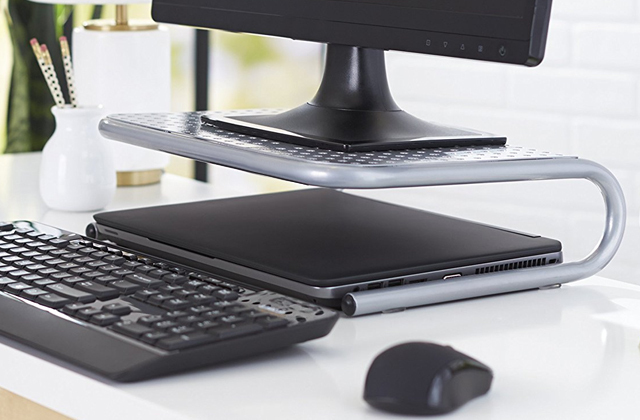 The stand is perfectly balanced, thanks to the added weight. 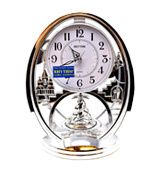 This way, you can place the clock on virtually any flat surface without worrying about tripping it over. The glass is not scratch-resistant. 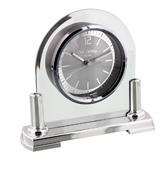 Small size and exquisite design of this clock are the main advantages of this affordable mantel model. Likewise, an easy-to-read clock face with distinct arms and dials make it great for mantelpieces, office tables, or nightstands. 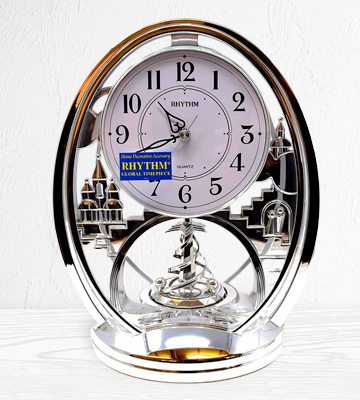 This contemporary mantel clock from Rhythm is one of the most unique models in our selection. Although it doesn’t produce any sounds while operating, it is still a great choice for decorating your mantelpiece. 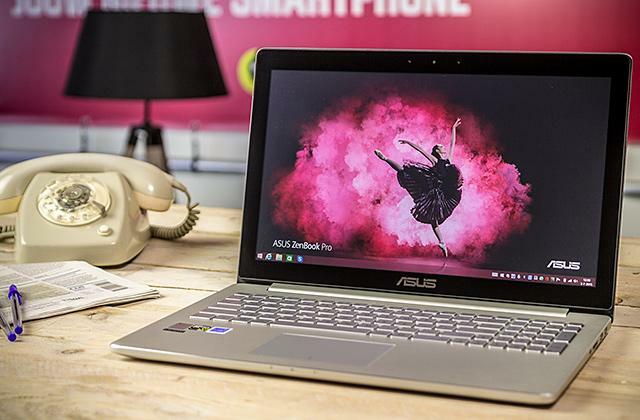 The first thing that catches the eye is its gorgeous design. The combination of premium plastic parts that are painted with silver paint and chrome details make the front panel of the product really stand out. Even though the polished surface is quite bright-looking (making sure that the clock can and will be noticed on top of the mantel), it won’t reflect too much light. This is achieved thanks to the clock's round edges that reduce light reflection to minimal levels. The dimensions of the digital clock are 19 x 13 x 26 cm, which should fit most interiors without any issues. Since the clock is digital, it requires 2 AA batteries to run and, fortunately, this model comes supplied with 1 set of batteries, so you won’t have to purchase them beforehand. The most important thing about this model, aside from its face and decorations, is the pendulum, of course. Contrary to regular pendulums that only move left and right, this one moves just like a rotating spiral, making it much more enjoyable to observe. 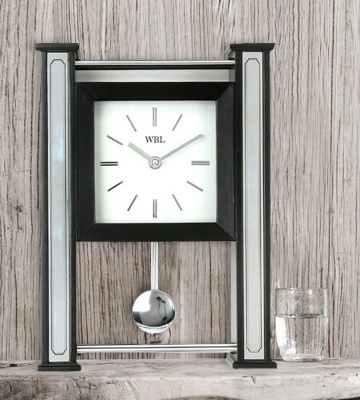 If you are looking for a clock that combines both modern and vintage design elements in one single piece, then this model from WBL will fit that bill nicely. To start off, the overall construction of the clock is fairly minimalistic, which makes it effortlessly blend with many interiors. The combination of black and white colours used for the exterior of the clock is time-proven, while the addition of a chromed pendulum makes the overall style feel complete. 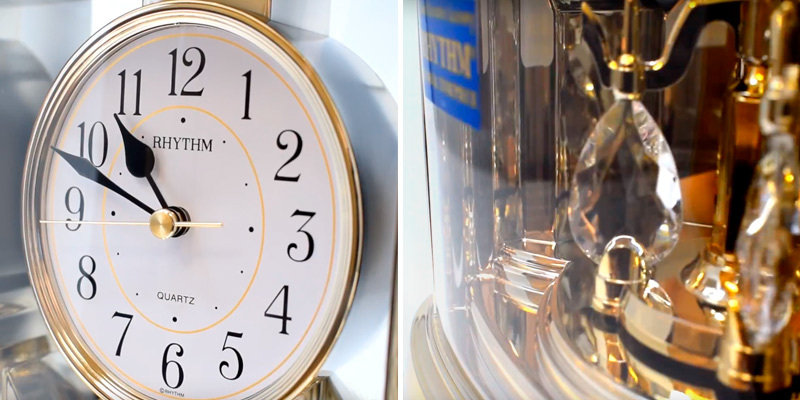 As for the action, the pendulum moves slightly faster than in other similar mantel clocks, which doesn’t perfectly align with the seconds' clock arm speed. Despite its relatively big dimensions of 23 x 7 x 30 cm, this model is quite lightweight for a large contemporary clock, so its installation shouldn't prove an issue. Likewise, the additional hooks on the back panel allow mounting the clock on the wall, making it a fairly universal model suitable for virtually any room. The clock has a very soft ticking sound to it that can only be heard from up close, so there’s no need to worry that it will distract you in any way. All things considered, thanks to its elegant design and a reliable clock mechanism, this model is definitely one of the best contemporary mantel clocks around. This contemporary mantel clock from Rhythm incorporates every little detail required to become a great addition to your mantelpiece. 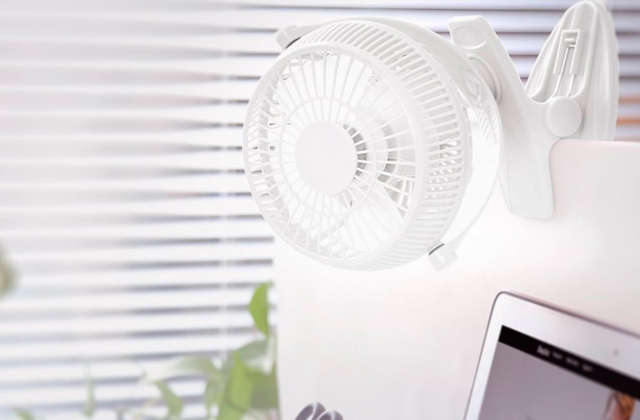 First of all, the housing of the clock, as well as the transparent front panel, is made of high-quality plastic that is durable and light at the same time. On top of that, most of the clock elements are covered with golden paint, which gives it a distinct mirror-like look. The only issue with the finish is that it can peel off if the clock isn’t cleaned regularly and properly. In order to avoid this issue, we recommend using soft cleaning liquids. As for the moving parts of the mechanism, the little yet gorgeous pendulum of this model is completed in a teardrop form, making it slightly different from the standard, dull-looking models. 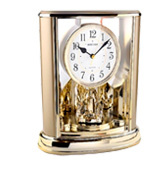 Additionally, the battery of this small mantel clock is located at the bottom part of the housing, meaning that you will have to turn the clock upside down in order to switch it. On the plus side, the clock doesn’t need to be winded up each time you change the batteries thanks to the high-quality mechanism. Lightweight, small, and simply elegant, the Anniversary Style from Rhythm will prove a good pick if you are looking for a mantel clock for a smaller fireplace that is moderately priced at the same time. Designed for smaller mantelpieces, the modern mantel clock from Widdop is a worthy contender for the role of your main timekeeper. Although it is rather small to be a good fit for big fireplaces and mantels, its dimensions of 16 x 5 x 15 cm make it ideal for counters, tables, and nightstands. 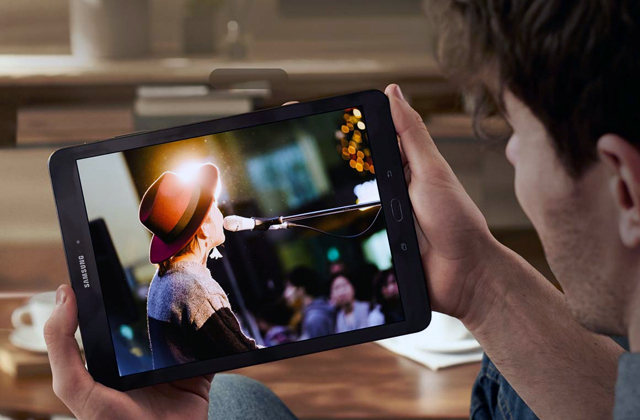 The clock's high-contrast face makes it easy to read even in dim light. What is more, the dial is also visible at different angles thanks to the reflective design. Moving on, let’s take a closer look at the clock mechanism itself. 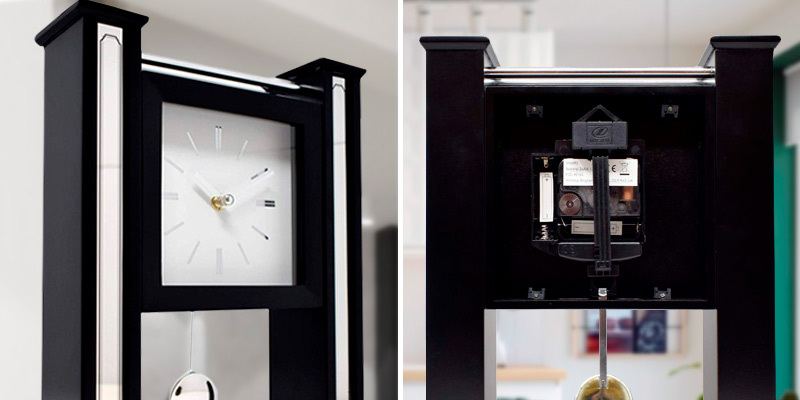 Powered by 1 AA battery, the heart of this clock model is located behind the dial itself. Likewise, the battery panel is also located on the back panel of the clock in case you need to change it. The latter, however, won’t happen too often, thanks to the quartz clock mechanism that requires little power to show the time accurately. 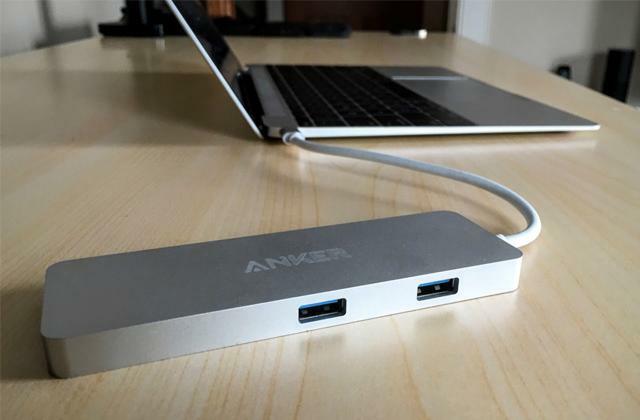 As for the materials, the base plate of the device is made of heavy plastic with a silver-like finish, while the face and clock plates are made of transparent glass. Together, they give the clock a unique look that catches the eye regardless of the amount of light in the room. 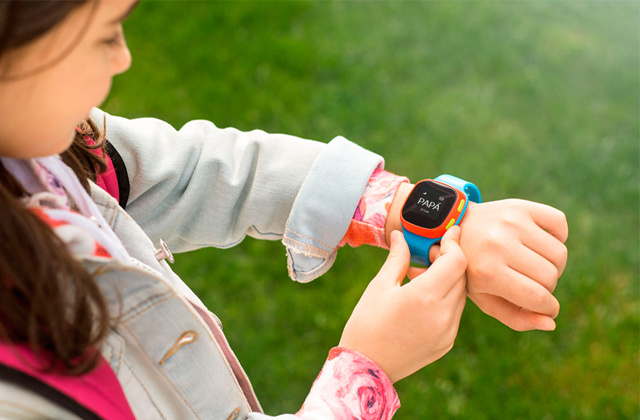 Additionally, both the dial and the arms feature fluorescent elements, making it easy to check the time even without any lights on. Wrapping things up, if you are searching for a compact and exquisite clock but don’t want to spend a fortune on it, then this model will be right up your alley. 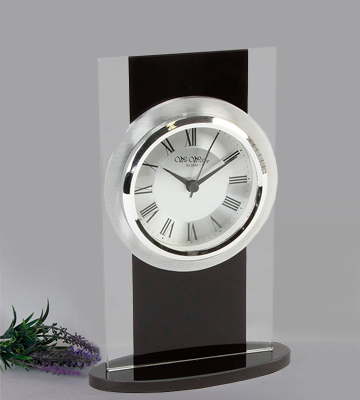 This modern mantle clock from Widdop features elements of both classic and free-standing clocks in one package. On top of the transparent housing, the unit incorporates high-quality materials that are durable and easy to clean. 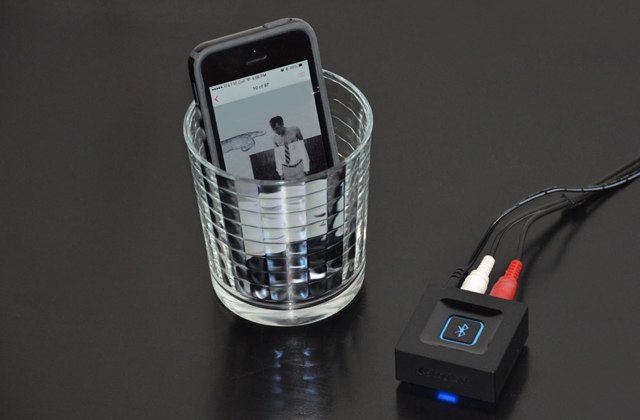 Although the design of this clock may seem flimsy to some users at first, due to the fact that the base is rather small compared to the clock's size, the actual build quality of the product is great. On top of that, the base won’t let the clock fall or tip over to the side. 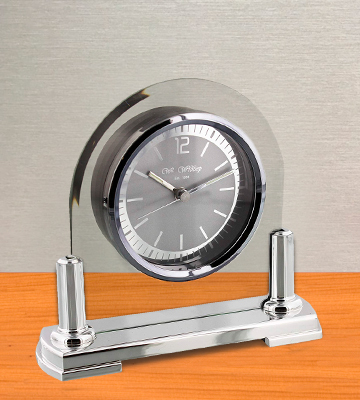 Surprisingly, even without side supports, the clock is fairly stable, provided that you place it on a flat surface. This is probably because the base is actually heavier than the glass plate, creating an ideal weight balance between the pieces. Additionally, the clock face itself is located in the centre of the glass plate, making it harder to trip accidentally. The clock's mechanism is battery powered and the operation of the unit is completely silent, making it ideal for both living rooms and bedrooms. The stark contrast between the clock face and the dial makes it easier to read regardless of time of day and the amount of light. All in all, the mantel clock from Widdop will be a great option for you if you need a stylish clock but don’t want to break a bank on large mantel clocks. What Is a Modern Mantel Clock? Unlike other clock types, the mantel clock has always been a centrepiece of any house interior that features a fireplace. Although modern mantel clocks are simple in their construction, they differ from regular table models thanks to their posh-looking design. Nowadays, most of the mantel clock models are battery powered, however, there are some old-school construction variants that feature a wind-up mechanism that produces that distinct clock tick. 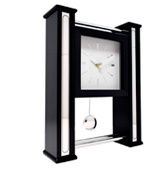 As for the materials, contemporary clocks seldom incorporate expensive materials such as marble, wood, or gold. Instead, they are made using plastic and metal parts with the addition of wooden elements as an ornament rather than as a core material. Even though digital clock mechanisms don’t require a pendulum to be accurate, some mantel clocks feature them as an additional decorative touch. If you are looking for a device that will replace the annoying alarm sound of your phone, we recommend these stationary alarm clocks. 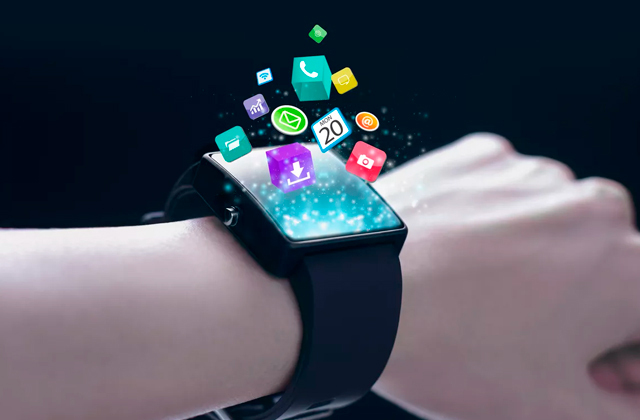 And if you can’t imagine your day without frequently checking your mobile apps, you should also consider a smart watch - it will not only show you the current time but will save a lot of it as well.